Flushing Away a PhD: Where Ecology and Sanitation Meet | Broadview Collaborative, Inc.
Last weekend I had the great fun of attending a reunion of sorts for those of us who shared Dr. Janis Antonovics as a professor, or who passed through his boisterous lab group that included anyone from post-docs to undergraduates and professors on sabbatical. While it was a reunion for Janis, because our experiences stretched over his nearly 50-year career to date, the rest of us were meeting many for the first time. But we all shared a common, intellectual touch point, the study of plant population genetics under Janis’ tutelage. The gathering included dinners on Friday and Saturday nights, as one might expect. The in-between time was filled with botanical excursions and (this is what nerds do when they gather) a day of talks. Each of us was invited to give a 10-minute talk on his or her latest work. At first I assumed that I, who had strayed from the academic path expected of a life after a Ph. D. from Duke University, would be a passive participant during this part of the weekend. After all, I haven’t done primary research of any significance since graduating in 1991. But on second thought, I decided to take the plunge and share some of the exciting trends in the world of sewage treatment. Though few ecologists, population geneticists or evolutionary biologists think about sanitation any more than the average librarian or stock broker, there is actually a strong intellectual connection between the two. Because my academic friends are mentoring the future innovators of the world, and are themselves members of communities faced with the routine civic decisions that add up to big impact, I wanted to use this chance to crack open the door into my watery world. Trying to pack Sewage Innovation 101 into 10 minutes turned out to be wishful thinking. My first draft included everything from self-contained eco-machines based on concepts dating back to the New Alchemy Institute in the 1970’s, to building-scale systems like those incorporated into Vancouver’s Dockside Green, to small communities that are employing engineered ecosystems like those designed by Natural Systems Utilities. But I settled on the less-is-more concept, and selected one simple story about relatively newly discovered bacteria that some say will revolutionize the way we treat sewage. And now I want to share it with you. To appreciate the importance of this little discovery, let’s first re-examine the nitrogen cycle. Here’s a little cartoon I found that shows the N-cycle the way I learned it 35 years ago: nitrogen gas (N2) is prevalent in the atmosphere but plants can’t use it directly. Plants need nitrogen to be converted into nitrate, either by lightning strike or by nitrifying bacteria, in order to use it. Plants then absorb nitrate through their roots and incorporate it into their cellular structure, especially amino acids that are used to build proteins. Animals need to get their nitrogen/amino acids through eating plants or other animals. 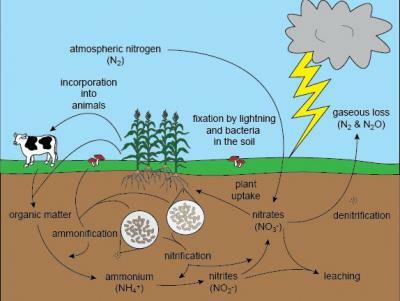 As organisms decay or defecate, nitrogen moves back into the system as ammonia, some of which reconverts back to nitrate, and the rest is denitrified and returned to the atmosphere. A sewage treatment plant compresses this cycle on an industrial scale. It takes in plant and animal (i.e. 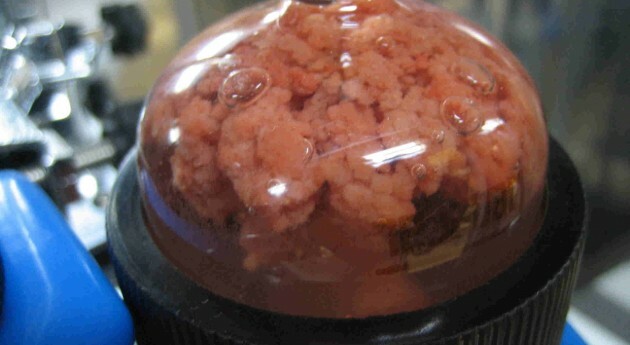 human) waste, and uses different mixes of bacteria (often called “bugs,” though they are decidedly not insects) to nitrify the waste ammonia into nitrite, and then another mix of bacteria denitrifies the nitrite back into nitrogen gas. This all works fine, but the problem is that the process requires immense amounts of energy. Some of this energy demand comes from bubbling air up through the sewage slurry to bring the oxygen to the aerobic bacteria who are doing all of this work, and some of the energy demand is tied directly to the food (generally in the form of methanol) that the bacteria need. And because the nitrate that inevitably slips through the process and makes its way into the sewage effluent feeds algae in the receiving waters — causing harmful and even toxic algae blooms — there is growing pressure to remove even more nitrate, which creates more energy demand. Meanwhile, about 20 years ago, bacteriologists discovered a new group of bacteria they called anammox bacteria, shorthand for “anaerobic ammonium oxidation” bacteria. These newly described species, which fall in the group of bacteria known as planctomycetes, normally live in oxygen-deprived marine sediments where they feed on the ammonia from decaying matter and convert it directly to nitrogen gas. By short-cutting the energy-intensive nitrifying and denitrifying steps, they redefined the nitrogen cycle. The exciting part, however, is that the newly discovered bacteria require neither oxygen nor carbon-based food. In other words, they are able to convert ammonia to nitrogen gas (N2) with no external energy or oxygen inputs. Think about how much sewage there is in the world and the amount of energy that sewage treatment currently uses. Can you see why this is a big deal? I don’t know the full story of how these new species, with a brand new ecological role, were first brought to the attention of sanitation ecologists, but I do know that the anammox process was harnessed first in European industrial wastewater treatment plants. Understanding the bacteria’s needs, and finding ways to cultivate these slow-growing, finicky bacteria, while keeping out more aggressive, “normal” bacteria has not been easy. But determined engineers and scientists at Hampton Roads Sanitation District (Virginia) and DC Water are the first to bring these processes to scale in the United States under very challenging, real-world conditions. Both of these utilities discharge to the Chesapeake Bay’s watershed and are under stringent expectations for nitrogen removal, which gives them extra incentive to find new but affordable solutions. 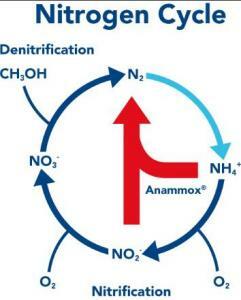 Anammox will allow them to meet nitrogen effluent limits while also reducing energy inputs and costs, and, of course, reducing greenhouse gas emissions. So while this may seem like it’s a far cry from my roots in plant population genetics and conservation biology, to me it is actually connected. The microscopic world where the bacteria consume, exhale, reproduce, compete and mutate is not that different than the visible one that produces the grasses, flowers and fungi that most of my former colleagues study. I’ve heard it said that bacteria are the next frontier of discovery, and if annamox is any indication of what lies ahead, we have good reason to be excited.